2P START! Live! : Music to My Ears Edition | 2P START! I hope you like music, because this episode has lots of it! From Wii Music to a Raybob Industries Remix, there’s some cool music headed your way and some not so cool music we won’t subject you to! Aww, I thought we would find out today. Oh well, more suspense won’t hurt us. Nice song, but nothing memorable. Wii Music? Well, here goes. Hey, Twinkle Twinkle is a classic. /sarcasm. And the track list does not sound stellar… at all. Is Do, Re, Mi the Sound of Music song? Or just a scale? Wait, unlocking songs?? That’s ultra lame. Especially when you start with child songs. The layering ideas is pretty neat, but is the music system deep enough to really do some awesome solo type stuff. Or can you create a 12 bar blues loop and pick instruments to improvise over the rhythm section? And I’m pretty sure Brawl had north of 300 songs. I know because I have all of them on my iPod. And nice Zelda arrangement, although the flute sounds…hmm… unflutish? That may just be me though. Either way, nice syncopation you had going. What Tim??? You have an album out? Where can I get ahold of this? Cool song, and cool remix. I would love to hear the original though. Actually, now that I think about it, that may be why I love this comic so much. You’re musicians, as am I, and our humor senses are the same. Just a thought. Chip from Cookie Crisp. I’m pretty sure the dog’s name is that. Not sure if that’s where they got their inspiration. And I refuse to be excited for Sonic Unleashed until its out and numerous people tell me otherwise. And I still think Sonic Adventure 2 is still the best 3D Sonic. It did have some platforming parts that had nothing to do with speed (I remember that one room at the end took me forever to figure out). Yea, like Waluigi has no purpose other than Wario’s sports partner. Seriously, nothing! It always bothered me. One of Nintendo’s weakest moments (which still shines like a supernova compared to Sega’s moves). Good point on the naming. Its slightly bothersome, but at the end of the day, not a big deal. I only buy Wii Nintendo points when I know what I want to buy ahead of time. And EA … WHY?? That’s just pretty awful. And I bought Super Monkey Ball: Banana Blitz at launch (don’t ask why, it was a moment of weakness). Let me tell you, those mini games are pretty much awful. But I loved the trombone one (I’m a trombone player, so that’s why). Trust me, it’s a lot easier in real life than in that game. 1. The remix was nice though I didn’t recognize the song. 2. And I’m still getting Wii Music despite all the negative things I’m hearing. 3. 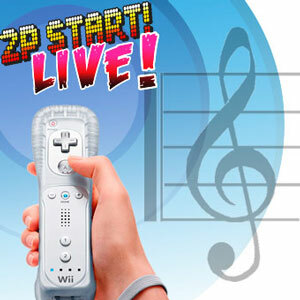 Believe me, Wii Music is not for people 10 and under, I mean, come on, Wake Me Up Before You Go-Go? 5. If you ask me, the cheerleader seems the most odd. 6. I think Motion Plus may have improved the game. I mean, how well do the sax and stuff work…? 9. And I’m sorry, but if anyone listens to that Zelda remix and doesn’t think it’s awesome…they’re very odd. 10. When you talked about Sonic fighting Robotnik….did they actually call him that, or is it still Eggman? 12. As for Sonic games, I actually prefer them to be Adventure-ish. Hence why I liked Heroes. 14. Why can’t we just have Tails? I say we swap out Tails and Rouge with each installment. XD I think I’m going to try to mention Rouge in every podcast comment from now on…we’ll see how that goes. 15. Surprisingly, Baby DK is actually one of the more bearable babies, but still, let’s leave him out of the games. Oh, and I’m going to go insane if they ever include Baby Rosalina. 16. Didn’t know about the Nintendo Points thing….hmmm. Now I do. But I do also agree that having them non-transferable is pretty stupid. 17. Wait…what exactly is the EA peripheral? I doubt it’s going to be very good, but yeah. 19. Raving Rabbids TV Party uses the balance board as well. 20. Tree of Tranquility should get an award for worst minigames. I love that game to death, but the minigames are just atrocious. What Tim??? You have an album out? Where can I get ahold of this? Cool song, and cool remix. I would love to hear the original though. I don’t know if Tim has an album out yet, but the remix was of a song from my album, “Jessica and the Silver Eclipse.” You can do a search on iTunes for it or head to raybobindustries.com to listen to a few samples and find an order page. (sigh) no.. he’s Eggman again. Let me guess… “Happy Birthday” will be making the list. It’s pronounced Rag-no-rock. It’s the Norse end-of-the-world. Twinkle Twinkle Little Star has the same rhythm as the Alphabet Song. Cool song Ray, not my thing, but cool. Also, in the second cutscene, Sonic juggled with only one hand. Personally I hated Sonic Adventure 2 because it started the things that made Sonic bad, Bottomless pits in every level, Levels made of nothing but grinding, lame plot, Shadow. It’s the Norse end of a period. It doesn’t signify the end of the world itself but rather the end of the Gods Reign in Norse mythology. Common mistake. Basically there is a world beyond the events of Ragnarok but the only god to see that period where the survivors leave the World Ash will be Baldur. Which is good because Baldur basically got screwed over repeatedly by Loki. Or is it sad that I know all this…. A music themed podcast! That was cool, you guys should have more themed podcasts. Did you really have to play your rendition of Zelda, Ray? 🙁 It’s hard to resist Wii Music now, that’s how much it sounded cool (albeit a bit off at times, but that’s understandable). I boycotted the game some more when Miyamoto explained the lack of “Nintendo themes” because, apparently, not everyone is familiar with Nintendo songs. I’m sorry, but what console is this game being played on? Nintendo something, I believe, Mr. Miyamoto. Right, right — he meant the naive masses out there that never picked up a Mario or Zelda game, he’s right. I’m happy that he’s quite giddy with his game, but that reason is laughable. I’m fine with not being able to share the points between my DSi and Wii. Nintendo must have prohibited it for a reason, you know? I know they usually don’t have solid reasons for their bizarre behaviours, but I wouldn’t want my points to get lost or something. Or worse, don’t register while transferring. The name did get a snort from me, though! Nintendo-ising everything, heh. EA, oh, EA. The sheer mockery, it kills. Oh, and: I was too afraid to click on the Sonic opening video. I don’t even want to know why. Actually it’s not called the Nintendo Wii. It’s just called the Wii. Nintendo has stated that they want the name to be short, something everyone knows. And it’s quite understandable that not many Nintendo songs were included, as Wii Music’s audience is obviously not someone that knows all the Nintendo songs, it’s for the small minority such as myself who like the casual stuff as well as the core stuff. Chips’s not a dog, he says so in the manga. He doesn’t say what he IS, tough, and Sonic can’t seem to figure it out either. And yes, he is named after Chocolate Chips, as far as I know. I had to stop listening when you started talking about the into, I want to wait for the game. Nice podcast guys! Wii Music sounds quite horrible, so I don’t think I’ll pick it up anytime soon. All of the remixes and such were really cool! As for Sonic Unleashed, I hope that it turns out really good, but I’m not crossing my fingers. It’s going to be hard to beat Sonic Adventure 2. So yeah, my comments have just gotten shorter for some strange reason.